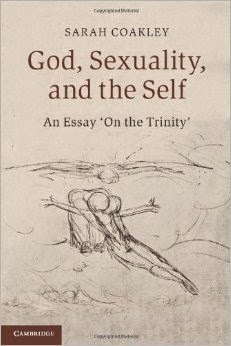 Last Friday, I received a copy of Sarah Coakley's God, Sexuality, and the Self: An Essay 'On the Trinity'. I have a brief review - my first, in fact - on Amazon. For the very act of contemplation - repeated, lived, embodied, suffered - is an act that, by grace, and over time, inculcates mental patterns of 'un-mastery', welcomes the dark realm of the unconscious, opens up a radical attention to the 'other', and instigates an acute awareness of the messy entanglement of sexual desires and desire for God. The vertiginous free-fall of contemplation, then, is not only the means by which a disciplined form of unknowing makes way for a new and deeper knowledge-beyond-knowledge; it is also...the necessary accompanying practice of a theology committed to ascetic transformation. There are times when the life of prayer begins seem rote, can appear to be something we "clock" as though God were keeping a ledger book of how much time we've logged. This is not to deny that the spiritual life requires discipline - it certainly does! - but it is to note that there's a way we can be tempted to domesticate prayer. We can, that is, begin to believe that we pray on our own terms and we begin to set the parameters of when, and how, the Spirit may enter our life. Hence I am rather captivated by her description of un-mastery. I know my own heart and soul well enough to say: I'm no spiritual master. Very often I limp into prayer, bruised and battered and tired, only to find how often my ego has attempted to assert itself over-and-against God. Try as I might, it's hard to stutter out the words, "Thy will be done" when "My will be done" seem more ready on my lips. On Sunday, after playing a feis, I went to a local parish where the Life Teen group performed a Passion Play. With Coakley's words still fresh in my mind, I prayed for the grace of un-mastery, for God to help me relax from trying to assert myself and to accept the slow and quiet work of grace that is always trying to reform my heart from the inside out. In my impatience, I typically want God to work in my life like a construction worker with a sledgehammer. When I open myself authentically, I find God works like an art-restorer with cotton-tips and dental picks. There is no better time than Holy Week to dare to ask for the grace of un-mastery. We see, in the events leading to Jesus' crucifixion, the embodiment of this grace. Jesus, his heart set solely on God, loved himself headlong into the timbers of the cross: by refusing to assert himself, to cling to worldly power, he put himself at odds with our sinful human system. In his human un-mastery, in living a life led only by the Spirit according to the Father's desires, he showed us how to be fully human. For this revelation of what it means to be fully human, we killed him. It is a fearful thing, this contemplative prayer. For once you begin, once you enter into the dark stillness of your heart, you begin slowly to see things anew. The shadows of life loom larger, the dark crevices seem all the more engulfing, sin seems all-consuming and threatening. And yet it is only by falling into this darkness, only by allowing oneself to be led by the Spirit through the terrors of the night, that one can hope to see the glimmer of dawn rising in the distance. We cannot conquer our sinful selves through self-help books but only by surrendering to God's grace, a dark grace leading us inwards in order to lead us upwards. We need to submit to a patient un-making in prayer and discipline in order that God may give us new hearts, hearts made for love alone.